Happy 2014! Let’s Do This Thing RIGHT. Let’s build a better web together. We have high hopes for 2014, and we want you to join us on this ride with new workshops, new inspiration, and new ideas. Let’s get started! It’s a new year, a time to evaluate what’s working for you and what’s just not. Are you stuck in a tired blur of routine? Are you looking for a spark of energized blood to run through those veins? We want to help. It’s our mission at Sparkbox to do things right—to build right—and we get our highs from sharing with others what we’ve learned. We’re hitting the road this year with new workshops and new material. We hope you’ll join us! 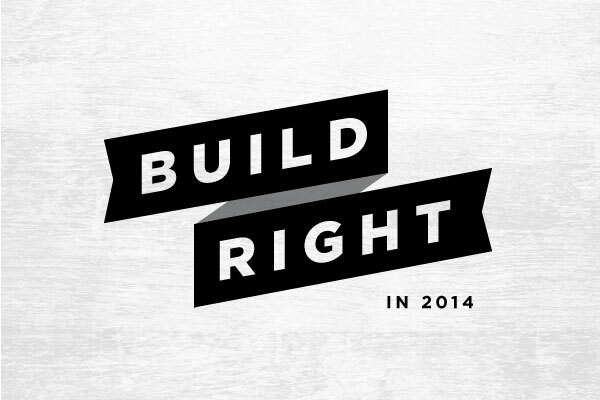 We’re ecstatic to announce our new series of workshops called Build Right! Tattoo these words to the forefront of your mind—together we can build a better, stronger web. You’ll want to give us an Aunt-Betty-at-Christmas hug and kiss once our Build Right: Frontend Tooling workshop takes you from the path of pain into the path of enlightenment. We’ll help you eliminate development pain and friction by introducing you to modern processes and tools, and we promise that you'll leave this workshop with your head overflowing with alternatives that challenge the way you're writing code today. Also, entering its third year with a refreshed name, our Build Right: Build Responsively workshop introduces attendees to the mindset and techniques necessary for embracing the fluid nature of the web. This popular workshop provides a broad sweep across the major topics involved in building responsive websites. We’ve also added fresh content to our 2014 format that will make you want to dance like a Cosby. You’re going to love it. We’re currently getting the Build Right website ready and will have dates and locations to you very soon. Until then, you can work on that Cosby dance.